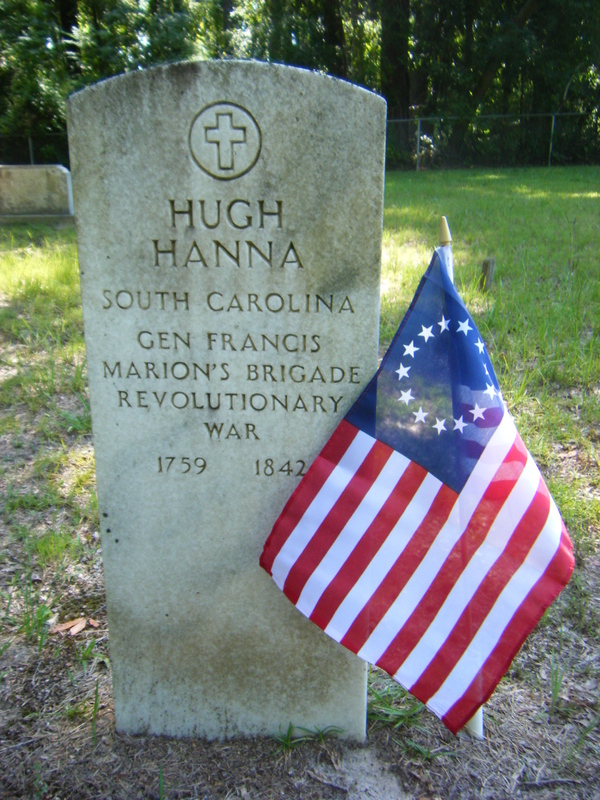 Hugh Hanna (Sr.) was born approximantely 1759, possibly in Ireland. A soldier in the American Revolution, he came south with General Nathanael Greene and joined General Francis Marion's Brigade where he was wounded in battle. The bullet extracted was preserved by descendants but its current location is not known. Hugh was a large land and slave owner and farmer on Lynches Lake. He erected the first water wheel for operation of a rice and grain mill. 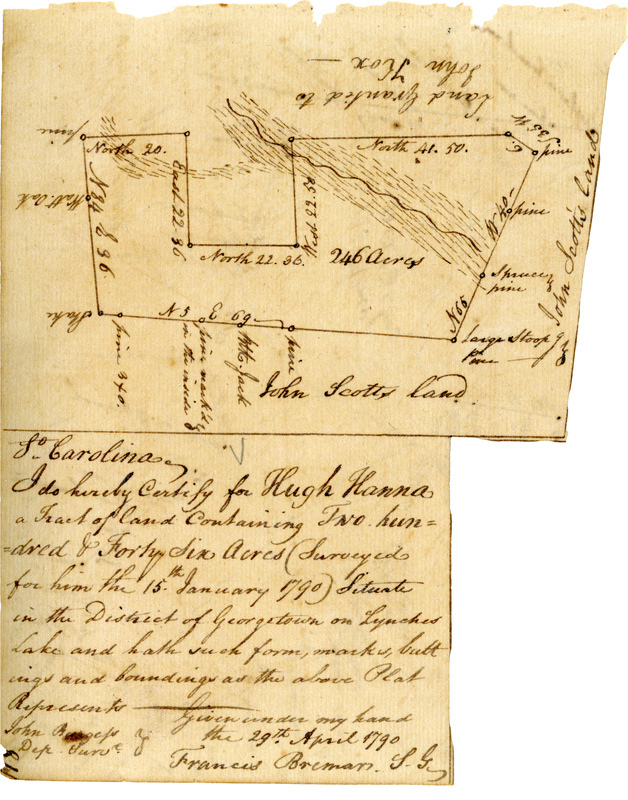 A 1790 land plat record shows Hugh Hanna was granted 246 acres on Lynches Lake. Died at his residence in Williamsburg district in the neighborhood of Indiantown, on the 7th August, Mr. Hugh Hanna, in the 83rd year of his age. The deceased was in our district, we believe the last survivor of that noble band of patriots who fought under Marion (General Francis Marion, "Swamp Fox"). 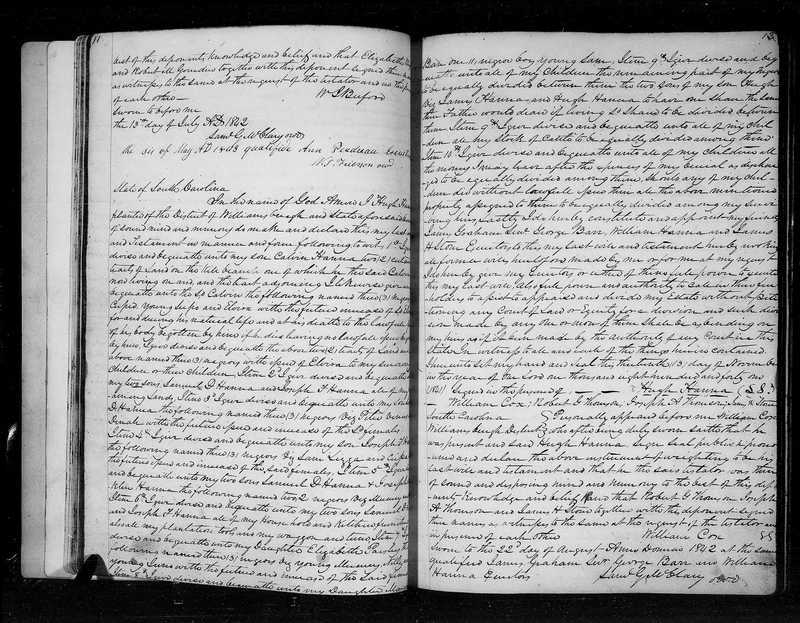 Hugh Hanna (1759-1842) first married Sarah Burrows (1776-1807), daughter of John Burrows and Elizabeth Scott. It was speculated but not proven that Hugh Hanna was the brother of Robert Hanna, and son of the progenitor in America (Thomas Hanna). Even recent DNA evidence has not been able to support this claim. 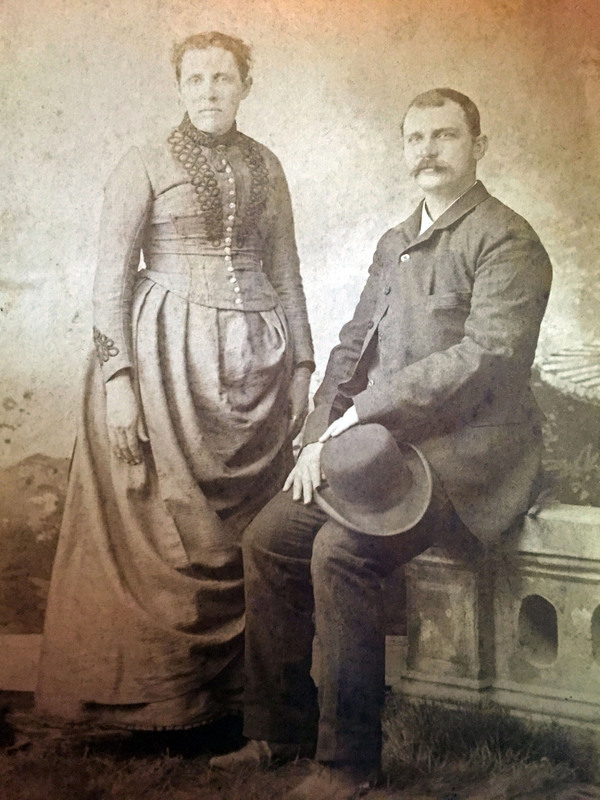 In fact the book A history of the Hanna family : being a genealogy of the descendants of Thomas Hanna and Elizabeth (Henderson) Hanna, who emigrated to America in 1763, written by Charles Elmer Rice and published in 1905, claims that Robert Hanna's brother Hugh was an apprentice in Bucks County, PA and married a woman named Rebecca. This Hugh died in 1821 and has an existing tombstone in that area, dispelling the possibility that would be our Hugh in South Carolina.